Welcome to July! We have been on a family vacation for the past two weeks leading to the lateness of my book club post. I also have empties and project updates coming over the next few days to catch you all up on where I am at. I did not post a Birchbox for June because the box came just days before we left. I will include June product reviews with my July post later this month. I chose the book this month for the Beauty Blogger Book Club. 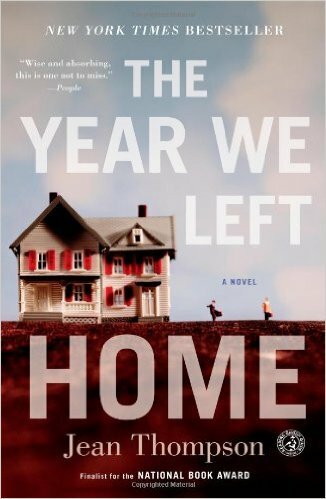 I chose The Year We Left Home by Jean Thompson. This book has been on my "to read" list for awhile and received a lot of hype when it was released awhile back. This story follows the members of one family beginning in the 70s and continuing through the present. It is the story of their journeys and where their choices lead them throughout the years. I must say I did not pick well. I had heard so much about this book and was disappointed when I finally read it. I found the characters very hard to relate to. There was no one I could identify with and root for. The characters seemed to have very little interaction, their stories were almost told individually so the chapters felt very choppy. The interaction, when it did happen, seemed forced. There were a lot of characters which made it somewhat confusing. And due to the jumping forward through time, I feel like I missed important pieces of what was happening with the characters. My one success was finishing this book because I have a bad habit of giving up on a book if I'm not liking it and moving on. Because I wanted to give a thorough review for you all, I did push through and finish this one. For July we will be reading Paper Towns by John Green. Lisa from Uncommon Wife Life chose this one and I haven't read any of his books (even though they are very popular) so I'm excited to read this one. And if you have suggestions of what I should read, I'm always looking for what to read next! It always baffles me when books get so many good reviews and everyone loves them and then I hate them. But I suppose that is why there are different types of books for those who have different interests.